Campbell Divinity School welcomed more than 300 people, including 130 alumni, to campus today to celebrate Alumni Day and the retirement of Michael G. Cogdill, founding dean of the school. Speaking at the chapel service in Cogdill’s honor, Jerry Wallace praised Cogdill’s 36 year career at Campbell and led the crowd in Butler Chapel in a unison “Dr. Cogdill, we love you” to conclude his introductory remarks. “We are here today to give thanks and express our love for a unique man called Mike Cogdill. Thank you for being there, with us and for us and alongside of us, in our walks of life,” said Wallace. Cogdill served as Founding Dean and Professor of Pastoral Leadership from 1996-2010. 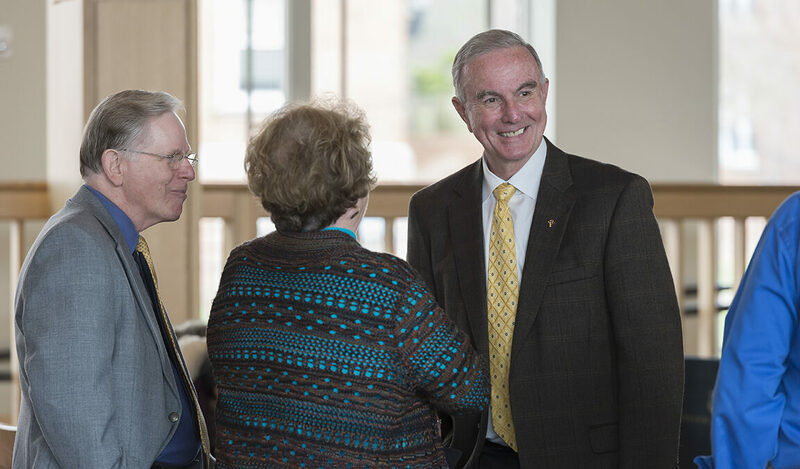 During his 14 years as dean, he led the development of an innovative curriculum, the building of a solid endowment, the achievement of the school’s full accreditation and the strengthening of church ties throughout Baptist and other circles. He also saw the creation of a Doctor of Ministry degree program and helped guide the work of the Butler Chapel Campaign Cabinet resulting in the building of Campbell’s first-ever chapel. A native of South Carolina, Cogdill earned academic degrees from Mars Hill College (BA in Religion), Southeastern Seminary (MDiv, DMin) and North Carolina State University (MS). His doctoral work was in congregational leadership and his additional master’s work focused on Religion and Society. Cogdill has been the recipient of numerous honors while at Campbell, including being named Professor of the Year in 1992 and having the 1997 yearbook, The Pine Burr, dedicated in his honor. After stepping down as dean, Cogdill served as a full time professor of Christian Ministry. During the morning’s ceremony, Clella Lee presented Cogdill with a book of letters of gratitude. Coordinated by Lynn Brinkley, the letters were written by alumni, students, faculty and staff to try to put into words the impact of Codgill’s leadership and teaching.